On Hunting Whales in Japan | This Japanese Life. Posted on April 10, 2013	by E.
The whaling controversy ignites more bad press and international disagreement than almost any contemporary political issue in Japan. If it sometimes seems like Japan is staking far too much on an industry that no one wants for a food nobody eats, that may be less to do with an irrational hatred for enormous aquatic mammals and more about resentment over how the ban was implemented: Whatever your stance on whaling, it’s easy to why Japan feels kind of swindled. I should carefully articulate that my position on whaling is aligned with most of the developed world, in that I find it to be a senseless industry which benefits nobody. That said, the collective consensus ignores any attempt of understanding Japan’s position and seems weirdly satisfied with racking it up to the Japanese being barbarians. This author does not like the whole whale-killing thing, but primarily I dislike intellectually lazy attempts at articulating the viewpoints of people I don’t agree with, which does a great disservice to discourse of any kind. This post is an effort to explain the Japanese perspective on whaling – not an attempt to convince you that slaughtering whales is awesome. K? The International Whaling Commission, or IWC, was founded in 1946, shortly after Japan surrendered and came to embrace whale meat as a cheap, readily available source of protein as it rebuilt its farming industries. Japan wasn’t alone. Lots of countries used whales for heating oil, machine lubrication and as a sort of proto-plastic. The UK was a leading producer of whale oil through the 1930s. Norwegians added modern whaling ships to the mix and instantly sparked a decline in whale stocks. Japan had been reliant on nets or beached whales, which turned into a kind of festival where the community got together to dismember the whale and make sure it was used completely. After introducing modern boats and harpoons, whales were soon being hunted. The IWC was initially an industrial support group designed to regulate whale populations to assure the long-term viability of the whaling industry. Because whales live in the ocean and because the ocean is a non-territory, the IWC was open to any nation, regardless of its stake in the whaling industry. There were membership fees, so initially membership was a self-selected group of stakeholders: Nations that whaled and wanted to make sure whaling stayed viable in the long-term. This went along as any industrial trade organization might, imposing loose quotas that ostensibly regulated whale supplies to control costs first and populations second. But then the 1960s happened and organizations sprung up on behalf of endangered species. Whales became pop stars: They are peaceful, enormous, gentle and intelligent beings, poster mammals for impassioned animal-rights advocacy. Whaling was already facing an economic crisis. Whales were dying out, making each whale harder to find and catch. 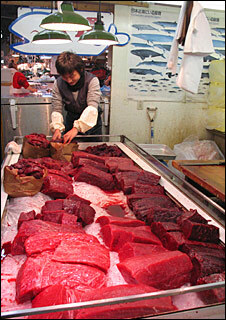 Cheap plastics and oils, and eliminating blubber from industrial applications, had weakened the whaling industry. It couldn’t afford to fight. Activists got none other than Richard Nixon to ban American whaling by the 1970s, back when Republicans cared about things like animals and international law. They ended whaling, declared whales endangered and banned the import of whalestuff. The president won authority to ban fish imports from whaling countries, and soon the US proposed a whaling moratorium to the IWC. Scientists didn’t think a moratorium was necessary, but the international activist community pressured whaling nations, threatened consumer boycotts of Japanese products and started sending ships to make whaling more difficult, the start of a long tradition in anti-whaling tactics. Most importantly, new rules banned the sale of whale products produced by anyone outside of the IWC, making it a mandatory international regulatory body for whaling. If you didn’t follow the rules, you would be banned from selling whale. The next step exploited a loophole in IWC membership: Because it dealt with international waters, any country could sign up. So Greenpeace and the Animal Welfare Institute began encouraging uninvolved nations to join the IWC, with the intent of adding votes supporting the moratorium. Soon, New Zealand, The Netherlands, and Australia declared firm anti-whaling votes. The Threshold Foundation paid membership fees for Seychelles; Greenpeace then offered support to 19 countries that didn’t whale. In 1982, this tactic secured the ¾ vote required to issue a temporary moratorium. (Japan is now criticized for doing the same, though perhaps Greenpeace was never so brazen as to recruit Mongolia, whose rich whaling tradition has been thwarted by land since the ice age). The temporary moratorium was proposed in 1986 and opposed by scientists, who saw it as an unnecessary overextension of the IWC charter. They encouraged the targeted protection of specific whale species, but the decks were stacked. Initially a 5-year moratorium to determine population numbers, it has been extended ever since. In 1992, the scientists proposed a conservative methodology for establishing huntable numbers of whales while maintaining sustainable stocks and was rejected. The chief scientist for the IWC resigned in frustration. Recently, a new suite of scientists has determined that the Japanese scientific studies haven’t contributed anything to the understanding of whale populations, a complete reversal of the original scientific board’s position. The IWC went on to ban whaling in huge swaths of the ocean now declared reservations, and to disregard population numbers in any new request to resume whaling. Australia and New Zealand now argue against whaling on humanitarian grounds (whalitarian?) regardless of the population of whales. The IWC provided some loopholes, one of which was the lethal scientific study of whales in the interest of understanding whale populations. After the ban, Japan immediately started a research program, making all of its research publicly available on the Internet in English and Japanese. The research showed scientists that up to 2,000 Minke whales could be senselessly slaughtered annually while maintaining the overall population. The moratorium was extended anyway, against the objections of the United Nations. New Zealand has voiced suspicions about Japan’s research program, largely because the 400 whales it captured for science were eaten and used for other purposes, which is completely allowed under IWC rules. Otherwise, you’d just kill whales and throw them away. Instead, Japan is killing the whales, trying to sell them, failing, and then throwing them away. It’s easy to assume this was a loop the Japanese chose to jump through to satisfy its vast hunger for whale, but what I’m saying here is, there is no vast hunger for whale. Japan doesn’t make any money from whaling. At its peak, Japan made about $10 million, and that was when people still wanted them. The industry was already dead when the moratorium was imposed, because whales are a terrible source of everything from food to oil to protein. Most research whales go uneaten or are distributed toward non-profit purposes, such as “Sweet and Salty Whale Stew” in mandatory JHS school lunches. The whales that are sold are typically directed toward the tiny handful of communities with actual whaling traditions; the money earned is 20 percent less than the cost of capturing them. Paradoxically, anti-whaling advocates keep mentioning that no one in Japan eats whale meat, then accuse Japan of having purely financial motives in its whaling research. The International Fund for Animal Welfare has a 24-page booklet condemning Japan for whaling under the “transparent veneer of science,” then spells out just how much money Japan loses in the process. This makes no sense. Surely, Japan’s motives aren’t purely scientific, but they also aren’t solely economic. It is also completely legal. People may accuse Japan of violating international law as a justification for ramming into the side of whaling ships, but research whaling is perfectly legal under the IWC and so is eating and selling whales killed for that research. Japan consistently does the paperwork required for permits, contributes to scientific research, and has proven beyond a doubt that some whale populations aren’t endangered. Nonetheless, it carries the stigma of whale vampires desperate to violate international law for the sake of throwing away blubber. Meanwhile, Norway, a member of the IWC, has blatantly resumed whaling for commercial purposes, but no one seems to give a damn. Iceland did the same in 1992 – and sells whale meat to Japan, which might be ironic. Japan has remained within the IWC and seems dedicated to the good-faith assumption that one day the moratorium will be lifted. That may actually be the craziest thing Japan is doing. Why is Japan fighting for whaling? And why is it sticking with the IWC? Japan is fighting for a few reasons. Chiefly, it is wary of external regulations on its few natural resources. The IWC moratorium came along at the same time as The Plaza Accord, where a bunch of Western countries united to weaken the US dollar at the expense of the yen. Japan went along with that, too, and ended up in 20 years of economic stagnation. This “global economy” stuff has been bad for Japan, but it doesn’t have much of a choice – 200 years of isolation didn’t work back in the day, and it isn’t working for North Korea now. So rather than risk alienation from the “global” part of the global economy, Japan acts passively. It reacts rather than leads. Japan lacks natural resources and depends on other countries to get them. Whales are meaningless, but the precedent whales create for future regulations could be devastating. When regulations are imposed on Japan without any scientific evidence, based on an incomprehensible appeal to “animal rights,” Japan gets a bit sensitive to the whimsical nature of foreign cultures. Japan’s insistence on whaling isn’t about whales: It’s about preserving scientific integrity as a method of regulation instead of weird cultural values that Japan doesn’t have. Japan is heavily reliant on soft power to influence policy, but with whaling, it hasn’t backed down despite the furor. This seems paradoxical, but Japan’s international status is so dependent on its reputation abroad that it would rather take a public relations hit on something that literally no one cares about in “real” politics, like whaling, than surrender the comfort of scientific justifications for future international economic policies. Otherwise, it finds itself courting the fickle favor of cultural differences. Here, Japanese tend to care more about what complicates the relationship between nature and humans: Air and sea pollution, for example. Animals, as a part of nature, form a part of that interconnection. Everyone, without fail, thanks the meal that they are about to eat for making itself available to be eaten. Responsible stewardship is considered the chief ethical consideration in Japan, while secular vegetarianism and animal rights activism are viewed as impractically extreme. Western groups criticize the barbaric nature of Japan’s whaling industry, calling Japan uncivilized and backwards. Scholars in the American Journal of International Law have argued that whaling “overlaps with the mindset that accepts the genocide of inferior human beings.” But annoying a small band of militant whale enthusiasts is worth the short-term risks to keep up broader, long-term policy concerns. Science must triumph over culture to preserve the role of objectivity in international policy directives. Otherwise, who knows what the West will try to impose next? 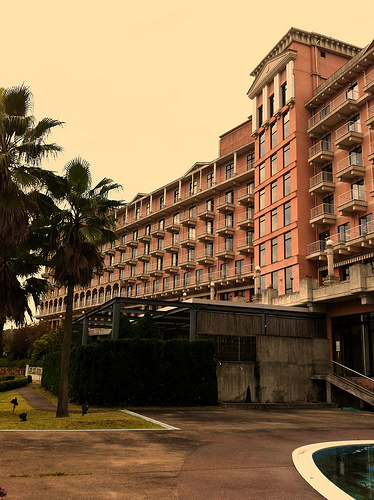 Another explanation for Japan’s whaling behavior comes from an unlikely place: The fully functioning four-star hotel on the top of a mountain in a rural farming village, connected to what remains of an abandoned ski complex in Oita prefecture. The hotel is mostly empty, with no attractions luring people to its rooms. The roads leading to it are hardly functional. A mini-mall across the street is abandoned; the ski equipment was torn down a year ago after a decade of disrepair. Sekia Hills is struggling to define itself as a wedding destination. It is a beautiful hotel; the staff is friendly, the food delicious. But it is also useless and out of place, a zombie industry propped up by government subsidies to keep up full employment in Japan. The whaling industry was on the wane when the ban came down. 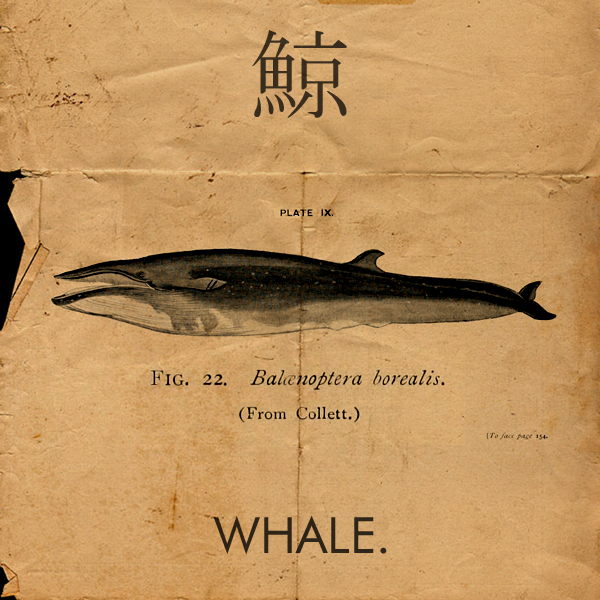 Japan’s interest in a scientific research proposal was less an “excuse” to hunt commercially, and more of an opportunity to retrofit a dying industry into a new one: Namely, with whaling banned internationally, Japan could subsidize its whaling fleets and communities in the name of “scientific research.” This would prevent the instant annihilation of the whaling industry, justify government subsidies to the whaling communities, and, at least at the outset, establish Japan as a contributor to international science on whale population control during the moratorium, a position which may not always have seemed so naïve. What Japan has now is a justification for subsidizing a dying industry. The widespread popularization of a rural and unheard of “whaling tradition” in Japan is not merely to sell its arguments abroad, but also to justify the tax dollars lost (about $10 million per year) on whaling subsidies. It is reasonable to look at Japan’s whaling position as out of sync with the rest of the world. But Japan has two obscured goals that are served by resisting the ban: For one, it sets a precedent for applying science as a foundation of international regulatory efforts, and two, it helps a domestic industry survive as a reinvented vessel for scientific research, justifying subsidies in the name of conservation, national science and cultural tradition. I’ll just remind everyone, again, that whether you find these agreeable is up to you, and that these opinions aren’t necessarily ones I share. But I hope, at least, it explains the Japanese attitude toward whaling in a somewhat rational way. Much of the research for this post came from Catalinac and Chan’s 2005 essay in Japan Forum, “Japan, the West, and the whaling issue: understanding the Japanese side,” which you can read in its entirety here. You can follow This Japanese Life on Facebook, or, if you miss Google Reader, you can import your RSS feeds at Bloglovin – starting with this one. This entry was posted in Uncategorized and tagged japan, whaling. Bookmark the permalink. If the industry operates at a loss for a foodstuff no one wants why isn’t the subsidy distributed to the whaling tradition communities directly saving fuel, pollution and the global population of whales in the process? Sounds more like irrational acts supporting immoral activity across the board. This was actually really interesting Eryk. There were a lot of things about the moratorium that I wasn’t aware of and, as someone with a vested interest in science, am a bit dismayed about with the process despite also not particularly supporting whaling. That said, one doesn’t need to pursue hunting as a primary method to determine the point of population sustainability. I’d like to think Japan is offering more in terms of scientific research out of the deal, but if not, hanging onto whaling as a form of defending science and culture should probably be rethought. I think the history definitely lends some sympathy to Japan and I don’t believe they’re acting maliciously, but that ‘responsible stewardship’ of the ocean is Japan’s primary concern seems entirely too generous. Well said. And I add that science void of ethics = horror. I think this is a really interesting article. It really reminds me of how a similar issue was portrayed in ‘The Cove’. When I watched ‘The Cove’ I was struck by how they had taken no Japanese speakers on their quest, no translators appeared and noone with Japanese cultural understanding was on screen either. Turn the tables- if the Japanese came, with limited-to-zero English and no real understanding of the culture and then began to criticise Western cultural/food production practices such as hunting, rodeos, battery farming or the like (all devisive practices in and of themselves, granted), I doubt they would be met with open hearts and minds. That movie won an Oscar for Best Documentary, but illustrated a similar attitude towards dolphins that much of the West shares towards whaling (and yes, I also think it is uneccessary and barbaric), the journalism was biased and the issue poorly researched. When the West blames Japan and refuses to try to understand the subtler issues at play they are reinforcing reductive stereotypes of the Other as barbaric and primitive. I don’t think what Japan does to whales and dolphins is right or good, it is simply awful, but that doesn’t mean I think that the way the West imposes its own cultural viewpoint, judgements and biases is right. If we want to change Japan’s behaviour, maybe we should listen more and act once we are in full possession of the facts. Thank you for being so brave walking into these dangerous waters! Even though there are so many contradictions in these article one hardly knows where to begin. Like, Japan relied on ‘beached’ whales but then has to prop up a fading ‘industry’….etc. Nevertheless the article makes it very clear that the waters are murky and to get a clearer picture one has to seriously study the history of this industry. Now, touting Japan’s sensitivity to being ‘regulated’ in some ways by whatever body (IWC in this case) is a bit like ‘you gotta be kidding’! Japan’s history of conquering and occupying and what have you of neighboring countries and people is a very long one and Japan still seems to struggle to see any of this as somewhat questionable. But again, thank you for this, it will help to get a deeper understanding of this issue! So far, it’s clear to me that, surprise, it’s all about money and being established that the Japanese modern whaling industry actually loses money, it’s about political fiefdoms. Nothing seems to make sense – the whole issue is highly irrational. PS. I personally am anti-whaling out of many reasons. I’m also heavily against the modern methods of raising chicken and various other ‘live stock’. Yes sorry- as I wrote, the whalers in Japan relied on net hunting (from boats) and beached whales, ie, close-shore hunts. After modernized boats and modernized harpoons (including refrigeration, making hunts from farther away possible) Japan started hunting whales in earnest as a food source. The distinction is between small-scale hunts in sparse locations vs wartime and post-war hunts on an industrial scale– From what Ive seen Japan had local traditions but no real national tradition of hunting whales until the 1930s. haha and whales brings me back to your blog eryk, of course! i learned a lot. i am glad you mentioned how not all whale species are endangered…i know you were avoiding getting into this but to be devil’s advocate, my question for the activists or those who lean that way is this: i still don’t understand why it’s more “senseless” or worse than other food industries, if the endangerment of the animals is not part of the equation. For me it’s the fact that nobody wants it- sort as senseless as building an abattoir and then just spitting the cow corpses into a landfill. If people used these animals like they used cows or chickens it’d be different – that said, how much meat is thrown away in the US every year? I’m not sure, but its probably horrifying. I personally think some of the senselessness comes also from the fact that the meat runs a high risk of toxicity from mercury and PCB accumulation. Sure, it’s high in protein, but when levels of mercury in meat are pushing the government limits (and in the case of dolphins, a whole other can of worms, way surpassing them), why put children and communities at risk of dangerous persistent chemical exposure when they don’t even really want the meat anyways? The conservation issue becomes entirely less relevant when the food isn’t guaranteed to be safe. A whale is a large animal to kill only to find out you can’t do anything with it. I think most animal preservation groups to be stupid and annoying. I also don’t see any reason the Japanese shouldn’t be allowed to sustainably hunt whales. It’s simply another type of meat, and trying to pass it off as anything other is simply a subjective opinion. Differentiating between whales and cows, etc is simply hypocrisy. For comparison, the Japanese are shocked when I mention I eat kangaroo. They idea that I’d eat something so cute and cuddly-looking astounds them. Proof that people on both sides of the fence occasionally live with their heads in the sand while spouting crap.